A really great image from NaturalMaven.com that pretty much sums up this post. 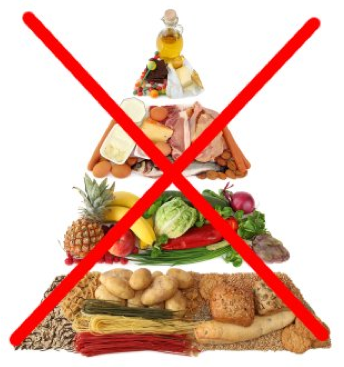 The food pyramid is still advocating the overabundant consumption of grains and grain products. 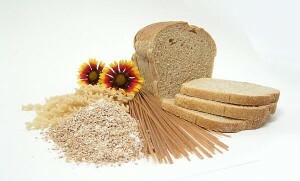 Not only are they advocating that everyone should be eating the majority of their calories from carbohydrates, when we know that every body is built differently and requires a different ratio of carbs, proteins and fats, they are also only recommending to make at least half of these grains whole. Although whole grains are not vastly different from their refined counterparts, at least they offer a little more nutrition than regular white flour, white rice and other refined grains. Grains in general cause a major spike in blood sugar, and later isulin, due to their low fat, low protein and high carbohydrate content. 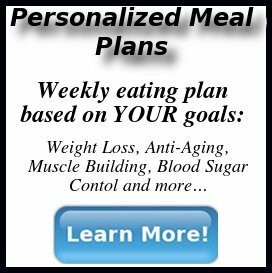 Eating the majority of one’s calories from this food group is just a recipe for disaster, and it’s amazing that the USDA is still recommending this as diabetes and obesity become even more prevalent. For most people the avoidance of grains would do tremendous good for their health, as grains are not a natural part of the human or animal diet. Doesn’t it make sense not to eat them, or at least eat them in small quantities? I believe certain people can, in fact, eat a small amount of gluten free grains and be OK, such as sprouted buckwheat and quinoa. However, grains like wheat are incredibly hard to digest because of their gluten, and many people are gluten sensitive without even noticing it. In the food pyramid, grains are emphasized as being more important than vegetables, fruits and fats. Vegetables provide much more nutrition, such as vitamins and antioxidants, fiber and minerals, and they are incredibly low on the glycemic index, meaning everyone can consume them and benefit from them without getting their blood sugar out of balance. Fruit, despite its sugar content which should be consumed moderately, also offers a more nutritious source of calories without the detriments experienced by high starch consumption. Fat, which makes up very little of the calories on the food pyramid, provides satiation and a slower release of carbohydrate breakdown, lowering the glycemic index of any meal. Who Will Be Most Affected By The New Dietary Guidelines? Children who are in public school and eat the lunches offered by the school will be mostly affected by these requirements. If a school decides not to adhere to the dietary requirements, the school will be penalized by not receiving any funding. This is already apparent, as more and more children are developing diabetes and obesity, conditions rarely seen in children, if at all, 50 years ago. 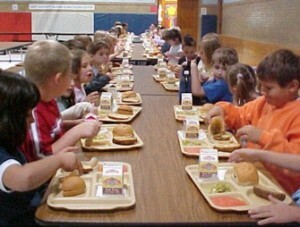 I would highly advise most parents to let their children take their lunch to schools, rather than eat in the lunch line. Some schools are offering healthy choices in their lunch menus, however it is not likely that most children are picking these items, especially if these healthy items are prepared poorly, such as plain broccoli or lettuce disguised as salad. You can’t control a child’s life forever, but starting them off right with a good foundation can help build healthy habits later on. 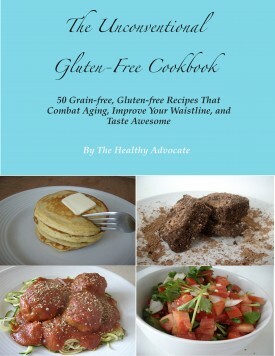 If you missed Part 1 of “The New Dietary Guidelines for Americans“, then please read it and put in your own two cents. Also, check out the really good report and and press release by The Weston A. Price Foundation on the new dietary guidelines. You are currently reading "The New Dietary Guidelines: Part 2"